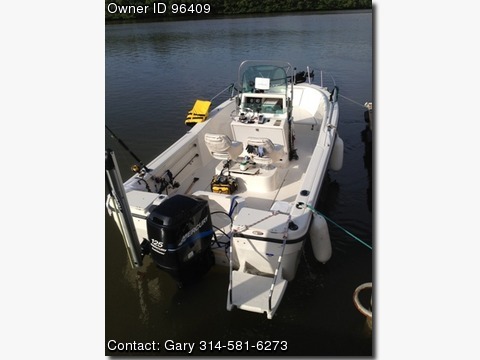 Please contact the owner directly @ 314-581-6273 or gc1bldr(at)aol(dot)com.Original Owner, only 1 year of salt water use. Currently stored indoors at Fish Tale Marina. "Motor Guide" trolling motor with foot and hand held remote control mounted on bow. "Power Pole" hydraulic anchor mounted on stern. "Lowrance" satellite linked GPS chart plotter and bottom sonar electronics mounted at helm. On board battery charger with 4 batteries. Built in live well, insulated fish lockers rod holders. Custom made full canvas mooring cover and custom made vinyl center console cover. Single axle galvanized trailer with surge breaks and brand new tires.